A charity runner, Wayne Russell, has just finished a monumental feat of running the 5,000 miles of British coastline in memory of his sister Carmel Webb who died three years ago after a battle with a rare heart condition. Despite Wayne’s tiring and sometime lonely journey, he has been well supported by fire and rescue services across the country. 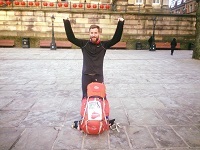 Wayne, 34 from Gloucester, set off on this extraordinary challenge on 6th September in London, last year, and on Saturday 9th July he completed his run by crossing the finishing line at the Cutty Sark in Greenwich. For the first part of his journey, Wayne was sleeping in a tent at bus stops, toilets, shower blocks, toilets and anywhere else he could find and sometimes in horrendous weather conditions, including the storms in December. During Wayne’s run up through Wales and Merseyside, a Watch Manager from Blackpool Fire Station, Patrick Thompson, was sent a video clip that Wayne had posted on his Facebook Page. Pat, who is also a keen runner, took an instant interest in Wayne’s challenge and decided to go and meet Wayne and run with him for a day. When Wayne reached Preston earlier this year, Pat and his wife picked Wayne up at the end of another gruelling run and took him back to their house in Blackpool where they gave him a bed for the night and gave him some proper food. The next morning, Pat took him back to Preston and Wayne ran to Fleetwood and when he had finished Pat invited Wayne back to his house again that night. As Wayne started to leave Lancashire, Pat wanted to see if he could help Wayne in anyway and using his contacts in Lancashire Fire and Rescue Service and other fire services in the UK, Pat arranged for Wayne to spend most evenings on fire stations across Northern England, Scotland and the East Coast of England. Pat gave Wayne contact numbers for individuals at each fire and rescue service and sent him an itinerary each week of where he needs to run to each day. Throughout the rest of his challenge, Wayne received amazing support from firefighters across the country. These firefighters cooked him food, gave him a space to sleep in a fire station and even kept him company during whilst running. The run has raised about £28,600 for the Superhero Foundation, which helps families in need of medical treatments. On completing the challenge, Mr Russell was greeted by a large crowd of friends, family and well-wishers including firefighters. He said: "I'm absolutely overwhelmed, to be honest. Having spent the best part of the last year alone, running into such an incredible reception was mind-blowing." "I want to thank every single person that donated, shared and supported me and my run. I also want to say a massive thank you to the fire and rescue services and their firefighters from across the country." he added. "We've raised more than £25,000 for an incredible cause, and I just can't imagine a more perfect end.